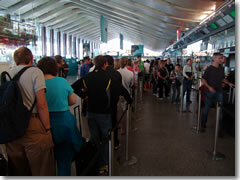 Use the automated machines to avoid the long ticket lines at Termini rail station. Trains are the easiest and most popular way to travel in Italy, and chances are the first place you'll see in Rome is Termini train station. First, though you have to get to Rome. Trains from Florence to Rome: At least three trains an hour (1.5–3.5 hr). Trains from Venice to Rome: 13 direct trains daily (3.5–7 hr). Trains from Milan to Rome: Hourly (3–6.5 hr). Trains from Naples to Rome: Two to three trains hourly; at least once an hour on Sundays (1–2.5 hr). Termini train station lies on the northeastern edge of the city center, at the north end of Via Cavour. It is the main public city bus terminus in town, and sits at the intersection of Rome's only two Metro (subway) lines. Many think "Termini" is so named because it is the "temrinus" of many rail lines. In fact, it is named after the nearby Terme di Diocleziano, the ancient Baths of Diocletion. Look for the McDonald's in the maze-like mall under Termini. Notice that the tables are ranged around a brick wall that slashes oddly right through the space on a diagonal. This is actually part of ancient Rome's city walls built in the AD 3rd century, making this plausibly the "oldest" McDonald's in the world—not that this is an excuse to eat here. Try Italian food instead; I hear it's quite good. Piazza dei Cinquecento, or "Square of the 500," is named (with a slight exaggeration) for the 430 Italian soldiers who died during the 1887 Battle of Dogali in modern-day Etriria as part of Italy's short-lived, ill-fated, far-too-late attempt at imeperial expansion. The station has become a bustling marketplace, with plenty of eateries and shops, most of them in an underground mall. At the end of the tracks is a busy area where people nervously watch the flip boards for track assignments. Note that some offices and businesses will be shuffled around for the next few years as construction work proceeds on a new elevated retail and apssenger space toward the right end of the tracks (19–24). The train information and assistance office is located in the by track 1 (to the right as you get to the end of the tracks when arriving). In their infinite idiocy, the powers of the train station have moved the Rome tourist information office (several times, actually) from former, more prominent locations in the main hall area to a hidden little wing called Ala Termini, located 1/3 of the way down the side of track 24 (arriving at the end of any other track, immediately turn left, then left again at the wall). Note that, if you are headed to Rome's Fiumicino airport from the Rome train station, the track for the airport express train—Track 25—is kind of hard to find. The deposito bagagli (left luggage) office (tel. +39-06-474-4777) is near the tourist information office alongside track 24. It's open daily 6am–midnight and charges €4 for the first 5 hours, €0.60 for each hour from 6 to 12 hours, then €0.20 for each hour after 12. Beyond the tracks, slip through a wide gap between the phalanx of newsstands and little bars to enter the Galleria Centrale, the main hall with some train information offices and exits at either end leading onto the station's side streets (an area packed with cheap hotels). Watch out for the hotel touts who will swarm you here (in my experience, any hotel that needs to field these slick salesmen isn't really good enough to get business on a more legitimate and old-fashioned way: being worthy of being passed along by word of mouth or recommended by sites like this or in guidebooks). Unless you happen to be heading to the area immediately around the Spanish Steps, the bus is a far better bet than the Metro, as Rome's subway system doesn't really serve the core of the historic center but rather skirts its edges. B (to Colosseo for Ancient Rome, or Circo Massimo for the Aventine/Testaccio). Nearly every train to Rome goes to or passes through Termini, but a few long-haul trains stop only at the Roma Tiburtina train station in the eastern part of the city. There are other secondary stations ranged about town—lined up in a gentle arc that pretty much defines the southern edge of the greater historic center—that most tourists never even see. 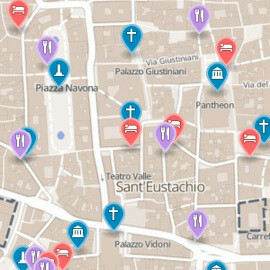 However, they can be convenient if your hotel happens to be in the neighborhood (perhaps the Roma-Trastevere train station, or Roma-Ostienese train station for the Aventine/Testaccio area), as well as sometimes for hopping regional rail lines for day trips out of town.